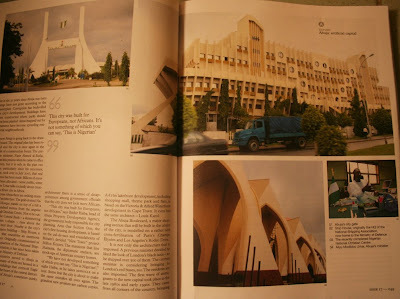 Check out October Monocle - there's an article on Abuja from page 48-51. We played hosts to writer Steve Bloomfield and dashing photographer Frederic Courbet for a while when they were over. Pray tell what does and african city look like? should it have xtra large huts and coconut tree traffic light? and half naked kids selling newspapers? WTF! This article may have a whole lot more in it but for the little i gleaned from the scan i was already annoyed!Im getting fed up with the attitude of westerns, one of my colleagues just asked me if I have ever seen snow? Forget the fact that I have lived in europe for years oo, I asked her what kind of stupid questions is that? is it coz im african! Just wanted to say thanks for loving Nigeria. I do love you very much for this. There are very few good people like you and I believe you have the most noble of intentions. And, like it or not, there are more half naked kids selling newspapers in Naija than there are in say, most European cities (you get them washing car windows there, and they tend to keep their shirts on) Perhaps we can think a little about creating circumstances where this is no longer a fact of life, rather than railing against an article in a high end leisure magazine, No? Mr Weate, thank you for the link. It's embarrassing to acknowledge that you clearly know more about Naija (and possibly care more about Naija) than I do. As they say, nice one!